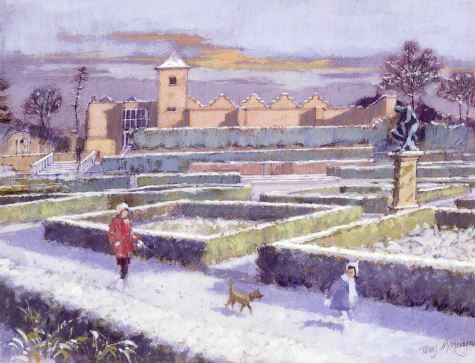 John Watkins is Head of Gardens and Landscape in the Conservation Department of English Heritage. He is very kindly coming to talk to us about English Heritage’s remarkable project to reconstruct a garden at Kenilworth Castle, created by 1575 for the visit of Queen Elizabeth I, using the archaeological and written evidence. Mr Watkins was himself responsible for coordinating the Kenilworth Garden project and designed the planting. 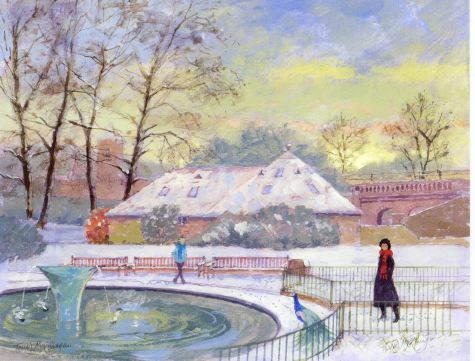 By happy coincidence John Watkins is very familiar with Holland Park as he spent the first 17 years of his life living within yards of Rassells Nursery where he worked in the 1970s. In the last few years he has been closely involved with the regeneration of Chiswick Park. With the current unreliability of the postal system we will all want to get our greeting cards out in good time. 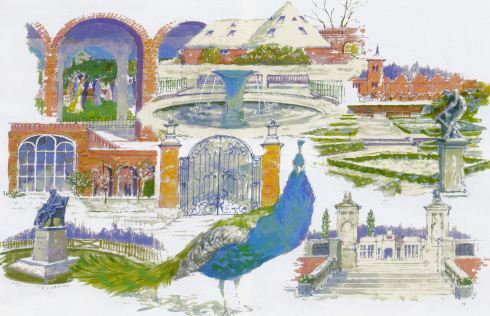 So this is a good moment to remind you of the handsome montage of Holland Park icons which comprise this year’s card. All members have had the full brochure including other designs with the last issue of this newsletter, but Rhoddy has some spare ones for those who ask. The cost, as of all the cards in the brochure, of £7.50 for 10 is very reasonable for cards of this size and quality. If you want to economise there are some packs at £6 for 10 which are a mixture of previous years’ Holland Park designs. See our order form for quantity discounts. The standard greeting within them is ‘With best wishes for Christmas and the New Year’. 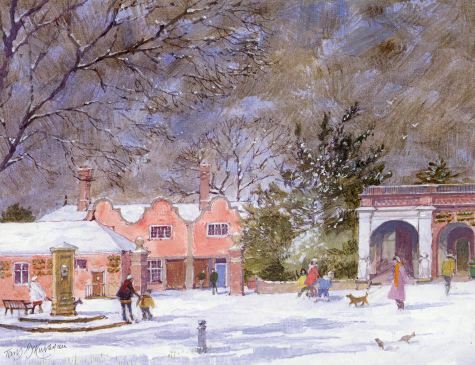 Most designs are also available blank inside, but for blanks Rhoddy only has supplies of the Holland Park montage. Unless you want your cards overprinted, we prefer you to order them from Rhoddy as that gives us an extra discount. Mountbatten has free delivery for a minimum of 35 cards throughout West and Central London but otherwise charges £5, whereas ours is free for 10 cards or more within our newsletter hand delivery area but we need to charge £1.05 per 10 outside that. We also have some cards left over from previous years. Designs may be ordered individually in packs of ten @ £7.50 or as packs mixed by our supplier @ £6.00. All have standard greetings. Free delivery or postage as above. As is the case every year you will have to hurry if you still need tickets for this our most popular event. 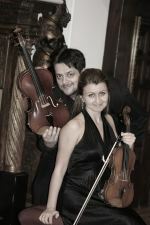 It might be that the concert is already sold out, so please phone Rhoddy first on 020 7602 0304 before sending a cheque. We are delighted that the Tallis Chamber Choir (TCC), directed by their founder and musical director Philip Simms, will again be able to entertain us with Christmas carols and readings. Since last year’s concert the choir has given two performances with the Locrian Ensemble and one with London Octave at St Martin-in-the-Fields, and two with the English Chamber Orchestra at Cadogan Hall. A programme celebrating the 500th anniversary of the accession of Henry VIII, in St Alfege Church Greenwich, where he was christened, and a Bach concert in Norwich Cathedral with soloists David Wilson Johnson and Linda Russell were highlights of the year, and a section of the choir gave a ‘Burns Night’ concert in Paris in January. In October they celebrate their 25 years of music making with a grand party likely to be attended by over a hundred singers past and present. 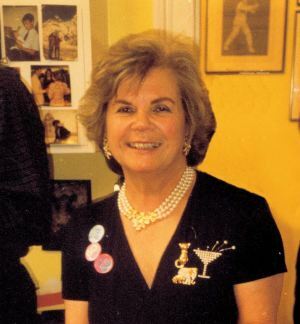 15 March 1938 – 2 July 2009 It is impossible to do justice to the rich and varied life of Carys Wynne in just a few paragraphs, but here we share a few thoughts in her memory and express our sincere appreciation for her contribution to The Friends of Holland Park. The fact that some 800 people poured into St Mary Abbots Church for Carys’s funeral on 10 July speaks volumes in itself. She was loved by many friends and relatives for her warmth, generosity, vitality and enormous capacity for friendship. Athome she was a devoted mother, wife and step-mother. In addition to lively family gatherings, Carys and her beloved Willoughby were also both extremely generous and energetic hosts, opening wide their doors for drinks gatherings, dinner parties, musical soirées or Sunday lunch parties. Much energy and thought was given to introducing guests to one another, ensuring that the conversation flowed and that no one was left out. Then there were Carys’s other duties: she had a firm Christian faith and was for several years a chalice assistant at her local church, a responsibility which she took very seriously, along with other duties in the church; she worked for many years for the travel company Abercrombie and Kent; she was a member of the Conservative Party and was for some time on their committee for Campden Ward. Another demanding and fulfilling role which Carys played was as Chairman of Kensington and Chelsea NADFAS, which involved her considerable gifts of networking, administration and creative thinking. Last but not least, she was Hospitality Officer and a trustee of The Friends of Holland Park. Sambourne House. You probably know that Leighton House Museum is currently closed to the public for a major restoration and refurbishment programme. 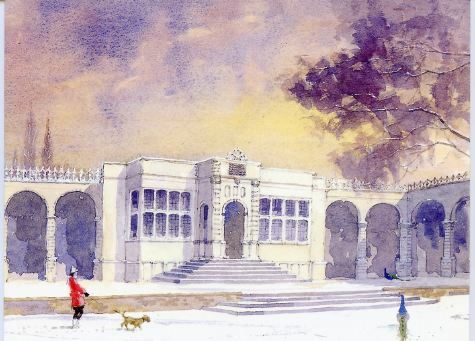 Daniel’s talk will describe the process of recreating the stunning interiors of Leighton’s House and put the house in context with the other artist studio-houses of Holland Park Road and Melbury Road. 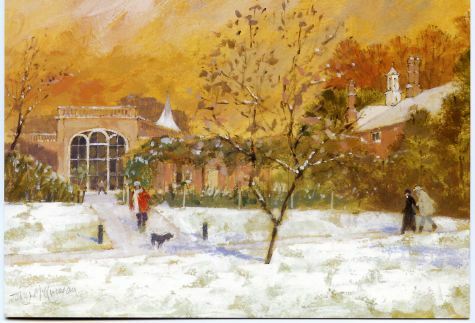 We have often thought that there is a very long gap between the springtime art exhibition and our October event when we have nothing on offer to members. Indeed, a number of you have said much the same to us and that you would like some kind of social occasion in the Park during the summer months. This year we propose to do just that and reintroduce a Friends' Pimm's Party. We are going to hold the party in the garden of the Youth Hostel, courtesy of Sally Martyn-Johns, the manager. Many of us have probably never had the opportunity of seeing this part of the Park, other than just a brief glimpse through the railings. It is most attractive and worth seeing. There is no opera performance scheduled for that evening, but perhaps we shall be serenaded by a rehearsal and of course the youth hostel will be in full swing. Conman An elderly man is going round the neighbourhood asking for cash donations to the Friends of Holland Park. Support for the Ecology Centre Under its new manager, Saskie Lovell, who was introduced to members in the last newsletter, the Ecology Centre is getting a much-needed facelift. While the bulk of the funding is coming from RBKC, it does not extend to several items of equipment which will significantly enhance the delivery of the services provided by the Centre. The Friends have helped with the donation of equipment before and we are very pleased to be able to do so again. Since Saskie's arrival in September, the Ecology Centre has a new floor and cupboards, there is a new storage container in the nursery yard, the wildlife pond has been drained, cleaned, relined, refilled and connected to the borehole, marginal plants have been ordered, a new biodiversity plan has been written (but not yet approved) and 50 new bird boxes for a wide variety of species have been obtained. This gives us great confidence that our donated items will be put to very good use! A ceiling-mounted digital projector will be a useful addition for both slideshows and displays by external speakers. It will allow the Centre to develop professional visual displays and provide opportunities for showing recorded or live videos of wildlife. The projector can also be used to show photos or videos during educational sessions or holiday activities. The laptop can be linked to the digital projector to display videos and presentations and can also be used in tandem with other devices. Webcams will be linked to the laptop and projector to record and show live images of otherwise hidden views from sites throughout the Park, such as round bird boxes and showing bird feeders or from within the Ecology Centre's live animal tanks. Again linked to the digital projector and laptop, a digital microscope will facilitate the projection of close-up images of objects on to a big screen. It will mainly be useful as an educational tool, allowing a group to see details of a biological specimen to aid in the teaching of subjects such as classification, adaptation and anatomy. The Orangery was more than half full to greet Chris and Sue Mitchell of "The Birds of Bray" and their birds of prey: falcons, hawks and owls, some of which we were allowed to stroke and hold on a leather-gloved hand after the talk. Had the Mitchells' trailer not been snowed under back home in Eaton Bray, we would have seen even more birds. As it was we were treated to a peregrine/lanner hybrid, a kestrel, a harris hawk, a white-faced scops owl, a barn (or "screech") owl, a tawny owl and a (huge) eagle owl. All had been bred in captivity and were therefore unfazed by humans. Most of the time they sat quietly on their perches, except for the restless barn owl which had not been fed for a while in order to make it demonstrate flying the length of the Orangery onto Sue's wrist for scraps of meat all the more readily. 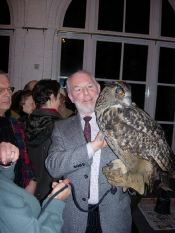 Sue sometimes takes the birds to hospitals and residential homes where, for a good therapeutic effect, she gets some of them to fly to patients. Birds of prey, or raptors, all evolved from the prehistoric raptorsaurus, keeping the four talons and the curved beak. Falconry is using a trained bird to catch wild prey. It is illegal to take a bird from the wild, so falconers long ago started to breed them in captivity. Once the birds are knowingly fed by humans they are "imprinted": they think of a human as a parent. Usually only very large birds such as the eagle owl would survive if let loose into the wild again after imprinting. The training process was described, we were shown the leather anklets, jesses and hoods (hence the term "hoodwinked") which the falcons wear. We learnt how they will not fly to the lure if they are not hungry enough (hence the term "fed up"): each type of bird has an optimum flying weight at which they will perform, and they must be weighed regularly and fed accordingly. Raptors would never attack human babies because they only eat meat which is covered in fur or feathers. Every 18 hours or so they disgorge a pellet consisting of fur or feathers together with whole bones (no, they do not crunch them up). This also has to be monitored since they would soon die if these pellets were not cast. We learnt how falcons have telescopic vision, how owls have forward-facing eyes but can turn their heads 270 degrees, have soundless flight, and asymmetrical ears to help them locate a mouse.